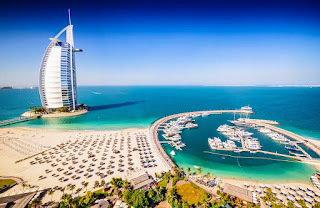 Visiting Dubai has certainly shot up in popularity in the last 10 years+, having visited almost 10 years ago as a couple we are very excited to be going again next year. We plan on going for 3-4 nights as a stop over again before heading to Hong Kong like last time. This is the world's largest choreographed fountain system! It's set on the manmade Burj Khalifa lake. The performances are held daily and last up to 5 minutes and evening show begins at 6pm and are every half hour until 11pm. There are also 2 performances in the daytime at 1pm and 1.30pm / 1.30pm and 2pm on Fridays. We actually stayed at the Atlantis last time which gave us free entry into the waterpark. It was epic and lot of fun for all ages! Did you know if you register in advance online you can get free entry into the waterpark on your Birthday. We didn't do this last time so it's on our list for next year. You can experience a thrilling 4x4 ride through the red Arabian Desert which ends with a BBQ dinner and you can also add in camel ride experience. This is a new one for us with the little one. Mattel Play! town is an indoor education play area located in city walk. There are 5 themed zones focus on different social skills and various educational elements through imaginative play. This is the place to take your little one 2-10yrs old. Everythign is based on the popular TV characters that your child will know and its open all year round so possibly one to do on a rainy day. This is one of the most iconic landmarks in Dubai is the Jumeirah Mosque. The mosque welcomes visitors of all faiths to admire the surroundings and learn about the local culture. The mosque is large enough to hold up to 1200 worshippers and build entirely from white stone in the medieval Fatimid tradition and it's simply stunning.